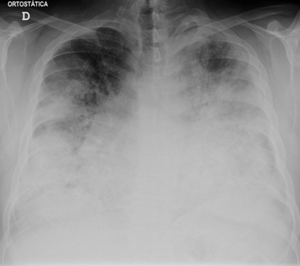 Chest X-ray of a severe case of legionellosis upon admission to the emergency department. The bacterium is found naturally in fresh water. It can contaminate hot water tanks, hot tubs, and cooling towers of large air conditioners. It is usually spread by breathing in mist that contains the bacteria. It can also occur when contaminated water is aspirated. It typically does not spread directly between people, and most people who are exposed do not become infected. Risk factors for infection include older age, a history of smoking, chronic lung disease, and poor immune function. Those with severe pneumonia and those with pneumonia and a recent travel history should be tested for the disease. Diagnosis is by a urinary antigen test and sputum culture. No vaccine is available. Prevention depends on good maintenance of water systems. Treatment of Legionnaires' disease is with antibiotics. Recommended agents include fluoroquinolones, azithromycin, or doxycycline. Hospitalization is often required. About 10% of those who are infected die. The number of cases that occur globally is not known. Legionnaires' disease is the cause of an estimated 2-9% of pneumonia cases that are acquired outside of hospital. An estimated 8,000 to 18,000 cases a year in the United States require hospitalization. Outbreaks of disease account for a minority of cases. While it can occur any time of the year, it is more common in the summer and fall. The disease is named after the outbreak where it was first identified, at a 1976 American Legion convention in Philadelphia. The length of time between exposure to the bacteria and the appearance of symptoms is generally 2–10 days, but can rarely extend to as long as 20 days. For the general population, among those exposed, between 0.1 and 5.0% develop the disease, while among those in hospital, between 0.4 and 14% develop the disease. Those with Legionnaires' disease usually have fever, chills, and a cough, which may be dry or may produce sputum. Almost all experience fever, while around half have cough with sputum, and one-third cough up blood or bloody sputum. Some also have muscle aches, headache, tiredness, loss of appetite, loss of coordination (ataxia), chest pain, or diarrhea and vomiting. Up to half of those with Legionnaires' disease have gastrointestinal symptoms, and almost half have neurological symptoms, including confusion and impaired cognition. "Relative bradycardia" may also be present, which is low or low-normal heart rate despite the presence of a fever. Laboratory tests may show that kidney functions, liver functions, and electrolyte levels are abnormal, which may include low sodium in the blood. Chest X-rays often show pneumonia with consolidation in the bottom portion of both lungs. Distinguishing Legionnaires' disease from other types of pneumonia by symptoms or radiologic findings alone is difficult; other tests are required for definitive diagnosis. Persons with Pontiac fever experience fever and muscle aches without pneumonia. They generally recover in 2–5 days without treatment. For Pontiac fever, the time between exposure and symptoms is generally a few hours to 2 days. Over 90% of cases of Legionnaires' disease are caused by Legionella pneumophila. Other types include L. longbeachae, L. feeleii, L. micdadei, and L. anisa. Legionnaires' disease is usually spread by the breathing in of aerosolized water and/or soil contaminated with the Legionella bacteria. Experts have stated that Legionnaires' disease is not transmitted from person to person. In 2014, one case of possible spread from someone sick to the caregiver occurred. Rarely, it has been transmitted by direct contact between contaminated water and surgical wounds. The bacteria grow best at warm temperatures and thrive at water temperatures between 25 and 45 °C (77 and 113 °F), with an optimum temperature of 35 °C (95 °F). Temperatures above 60 °C (140 °F) kill the bacteria. Sources where temperatures allow the bacteria to thrive include hot water tanks, cooling towers, and evaporative condensers of large air conditioning systems, such as those commonly found in hotels and large office buildings. Though the first known outbreak was in Philadelphia, cases of legionellosis have occurred throughout the world. L. pneumophila thrives in aquatic systems, where it is established within amoebae in a symbiotic relationship. Legionella bacteria survive in water as intracellular parasites of water-dwelling protozoa, such as amoebae. Amoebae are often part of biofilms, and once Legionella and infected amoebae are protected within a biofilm, they are particularly difficult to destroy. In the built environment, central air conditioning systems in office buildings, hotels, and hospitals are sources of contaminated water. Other places the bacteria can dwell include cooling towers used in industrial cooling systems, evaporative coolers, nebulizers, humidifiers, whirlpool spas, hot water systems, showers, windshield washers, fountains, room-air humidifiers, ice-making machines, and misting systems typically found in grocery-store produce sections. The bacteria may also be transmitted from contaminated aerosols generated in hot tubs if the disinfection and maintenance programs are not followed rigorously. Freshwater ponds, creeks, and ornamental fountains are potential sources of Legionella. The disease is particularly associated with hotels, fountains, cruise ships, and hospitals with complex potable water systems and cooling systems. Respiratory-care devices such as humidifiers and nebulizers used with contaminated tap water may contain Legionella species, so using sterile water is very important. Other sources include exposure to potting mix and compost. Legionella spp. enter the lungs either by aspiration of contaminated water or inhalation of aerosolized contaminated water or soil. In the lung, the bacteria are consumed by macrophages, a type of white blood cell, inside of which the Legionella bacteria multiply, causing the death of the macrophage. Once the macrophage dies, the bacteria are released from the dead cell to infect other macrophages. Virulent strains of Legionella kill macrophages by blocking the fusion of phagosomes with lysosomes inside the host cell; normally, the bacteria are contained inside the phagosome, which merges with a lysosome, allowing enzymes and other chemicals to break down the invading bacteria. People of any age may suffer from Legionnaires' disease, but the illness most often affects middle-aged and older persons, particularly those who smoke cigarettes or have chronic lung disease. Immunocompromised people are also at higher risk. Pontiac fever most commonly occurs in persons who are otherwise healthy. The most useful diagnostic tests detect the bacteria in coughed-up mucus, find Legionella antigens in urine samples, or allow comparison of Legionella antibody levels in two blood samples taken 3–6 weeks apart. A urine antigen test is simple, quick, and very reliable, but only detects L. pneumophila serogroup 1, which accounts for 70% of disease caused by L. pneumophila, which means use of the urine antigen test alone may miss as many as 30% of cases. This test was developed by Richard Kohler in 1982. When dealing with L. pneumophila serogroup 1, the urine antigen test is useful for early detection of Legionnaire's disease and initiation of treatment, and has been helpful in early detection of outbreaks. However, it does not identify the specific subtypes, so it cannot be used to match the person with the environmental source of infection. The Legionella bacteria can be cultured from sputum or other respiratory samples. Legionella spp. stain poorly with Gram stain, stains positive with silver, and is cultured on charcoal yeast extract with iron and cysteine (CYE agar). A significant under-reporting problem occurs with legionellosis. Even in countries with effective health services and readily available diagnostic testing, about 90% of cases of Legionnaires' disease are missed. This is partly due to the disease being a relatively rare form of pneumonia, which many clinicians may not have encountered before, thus may misdiagnose. A further issue is that people with legionellosis can present with a wide range of symptoms, some of which (such as diarrhea) may distract clinicians from making a correct diagnosis. Keep water temperature either above or below the 20–50 °C (68–122 °F) range in which the Legionella bacterium thrives. Prevent stagnation, for example, by removing from a network of pipes any sections that have no outlet (dead ends). Where stagnation is unavoidable, as when a wing of a hotel is closed for the off-season, systems must be thoroughly disinfected just prior to resuming normal operation. Prevent the buildup of biofilm, for example, by not using (or by replacing) construction materials that encourage its development, and by reducing the quantity of nutrients for bacterial growth that enter the system. Periodically disinfect the system, by high heat or a chemical biocide, and use chlorination where appropriate. Treatment of water with copper-silver ionization or ultraviolet light may also be effective. System design (or renovation) can reduce the production of aerosols and reduce human exposure to them, by directing them well away from building air intakes. An effective water safety plan also covers such matters as training, record-keeping, communication among staff, contingency plans, and management responsibilities. The format and content of the plan may be prescribed by public health laws or regulations. Effective antibiotics include most macrolides, tetracyclines, ketolides, and quinolones. Legionella spp. multiply within the cell, so any effective treatment must have excellent intracellular penetration. Current treatments of choice are the respiratory tract quinolones (levofloxacin, moxifloxacin, gemifloxacin) or newer macrolides (azithromycin, clarithromycin, roxithromycin). The antibiotics used most frequently have been levofloxacin, doxycycline, and azithromycin. Macrolides (azithromycin) are used in all age groups, while tetracyclines (doxycycline) are prescribed for children above the age of 12 and quinolones (levofloxacin) above the age of 18. Rifampicin can be used in combination with a quinolone or macrolide. Whether rifampicin is an effective antibiotic to take for treatment is uncertain. The Infectious Diseases Society of America does not recommend the use of rifampicin with added regimens. Tetracyclines and erythromycin led to improved outcomes compared to other antibiotics in the original American Legion outbreak. These antibiotics are effective because they have excellent intracellular penetration in Legionella-infected cells. The recommended treatment is 5–10 days of levofloxacin or 3–5 days of azithromycin, but in people who are immunocompromised, have severe disease, or other pre-existing health conditions, longer antibiotic use may be necessary. During outbreaks, prophylactic antibiotics have been used to prevent Legionnaires' disease in high-risk individuals who have possibly been exposed. The mortality at the original American Legion convention in 1976 was high (29 deaths in 182 infected individuals) because the antibiotics used (including penicillins, cephalosporins, and aminoglycosides) had poor intracellular penetration. Mortality has plunged to less than 5% if therapy is started quickly. Delay in giving the appropriate antibiotic leads to higher mortality. The fatality rate of Legionnaires' disease has ranged from 5 to 30% during various outbreaks and approaches 50% for nosocomial infections, especially when treatment with antibiotics is delayed. Hospital-acquired Legionella pneumonia has a fatality rate of 28%, and the principal source of infection in such cases is the drinking-water distribution system. Outbreaks of Legionnaires' disease receive significant media attention, but this disease usually occurs in single, isolated cases not associated with any recognized outbreak. When outbreaks do occur, they are usually in the summer and early autumn, though cases may occur at any time of year. Most infections occur in those who are middle-aged or older. National surveillance systems and research studies were established early, and in recent years,[when?] improved ascertainment and changes in clinical methods of diagnosis have contributed to an upsurge in reported cases in many countries. Environmental studies continue to identify novel sources of infection, leading to regular revisions of guidelines and regulations. About 8,000 to 18,000 cases of Legionnaires' disease occur each year in the United States, according to the Bureau of Communicable Disease Control. Between 1995 and 2005, over 32,000 cases of Legionnaires' disease and more than 600 outbreaks were reported to the European Working Group for Legionella Infections. The data on Legionella are limited in developing countries and Legionella-related illnesses likely are underdiagnosed worldwide. Improvements in diagnosis and surveillance in developing countries would be expected to reveal far higher levels of morbidity and mortality than are currently recognised. Similarly, improved diagnosis of human illness related to Legionella species and serogroups other than Legionella pneumophila would improve knowledge about their incidence and spread. A 2011 study successfully used modeling to predict the likely number of cases during Legionnaires’ outbreaks based on symptom onset dates from past outbreaks. In this way, the eventual likely size of an outbreak can be predicted, enabling efficient and effective use of public health resources in managing an outbreak. The first recognized cases of Legionnaires' disease occurred in 1976 in Philadelphia; among more than 2000 attendees of an American Legion convention held at the Bellevue-Stratford Hotel, 182 attendees contracted the disease and 29 of them died. In April 1985, 175 people in Stafford, England, were admitted to the District or Kingsmead Stafford Hospitals with chest infection or pneumonia. A total of 28 people died. Medical diagnosis showed that Legionnaires' disease was responsible and the immediate epidemiological investigation traced the source of the infection to the air-conditioning cooling tower on the roof of Stafford District Hospital. In March 1999, a large outbreak in the Netherlands occurred during the Westfriese Flora flower exhibition in Bovenkarspel; 318 people became ill and at least 32 people died. This was the second-deadliest outbreak since the 1976 outbreak and possibly the deadliest, as several people were buried before Legionnaires' disease had been diagnosed. The world's largest outbreak of Legionnaires' disease happened in July 2001 with people appearing at the hospital on July 7, in Murcia, Spain. More than 800 suspected cases were recorded by the time the last case was treated on July 22; 636–696 of these cases were estimated and 449 confirmed (so, at least 16,000 people were exposed to the bacterium) and six died, a case-fatality rate around 1%. In late September 2005, 127 residents of a nursing home in Canada became ill with L. pneumophila. Within a week, 21 of the residents had died. Culture results at first were negative, which is not unusual, as L. pneumophila is a fastidious bacterium, meaning it requires specific nutrients and/or living conditions to grow. The source of the outbreak was traced to the air-conditioning cooling towers on the nursing home's roof. As of November 12, 2014, 302 people have been hospitalized following an outbreak of Legionella in Portugal and seven related deaths have been reported. All cases, so far, have emerged in three civil parishes from the municipality of Vila Franca de Xira in the northern outskirts of Lisbon, Portugal, and are being treated in hospitals of the Greater Lisbon area. The source is suspected to be located in the cooling towers of the fertilizer plant Fertibéria. Twelve people were diagnosed with the disease in the Bronx, New York, in December 2014; the source was traced to contaminated cooling towers at a housing development. In July and August 2015, another, unrelated outbreak in the Bronx killed 12 people and made about 120 people sick; the cases arose from a cooling tower on top of a hotel. At the end of September, another person died of the disease and 13 were sickened in yet another unrelated outbreak in the Bronx. The cooling towers from which the people were infected in the latter outbreak had been cleaned during the summer outbreak, raising concerns about how well the bacteria could be controlled. On August 28, 2015, an outbreak of Legionnaire's disease was detected at San Quentin State Prison in Northern California; 81 people were sickened and the cause was sludge that had built up in cooling towers. Between June 2015 and January 2016, 87 cases of Legionnaires' disease were reported by the Michigan Department of Health and Human Services for the city of Flint, Michigan, and surrounding areas. Ten of those cases were fatal. In November 2017, an outbreak was detected at Hospital de São Francisco Xavier, Lisbon, Portugal, with up to 53 people being diagnosed with the disease and five of them dying from it. In Quincy, Illinois, at the Illinois Veterans home, a 2015 outbreak of the disease killed 12 people and sickened more than 50 others. It was believed to be caused by infected water supply. Three more cases have been identified as of November 2017. In the fall of 2017, 22 cases were reported in a Legionnaires' disease outbreak in Anaheim, CA's Disneyland theme park. It was believed to have been caused by a cooling tower that releases mist for the comfort of visitors. The contaminated droplets likely spread to the people in and beyond the park. The disease is named after the outbreak where it was first identified, at a 1976 American Legion convention in Philadelphia. Journalists Paul Carpenter and Bob Dvorchak were responsible for coining the term 'Legionnaires disease.' Carpenter broke the original Legionnaires disease story back in 1976, and Dvorchak, who was the editor on the Associate Press desk who handled Carpenter’s story, first came up with that term. ^ a b c d e f Cunha, BA; Burillo, A; Bouza, E (23 January 2016). "Legionnaires' disease". Lancet. 387 (10016): 376–85. doi:10.1016/s0140-6736(15)60078-2. PMID 26231463. ^ a b c d "Legionella (Legionnaires' Disease and Pontiac Fever) Signs and Symptoms". CDC. January 26, 2016. Archived from the original on 12 March 2016. Retrieved 21 March 2016. ^ a b "Legionella (Legionnaires' Disease and Pontiac Fever) About the Disease". CDC. January 26, 2016. Archived from the original on 25 March 2016. Retrieved 21 March 2016. ^ a b c d e f g "Legionella (Legionnaires' Disease and Pontiac Fever) Causes and Transmission". CDC. March 9, 2016. Archived from the original on 25 March 2016. Retrieved 21 March 2016. ^ a b "Legionella (Legionnaires' Disease and Pontiac Fever) People at Risk". CDC. January 26, 2016. Archived from the original on 27 March 2016. Retrieved 21 March 2016. ^ a b "Legionella (Legionnaires' Disease and Pontiac Fever) Diagnostic Testing". CDC. November 3, 2015. Archived from the original on 12 March 2016. Retrieved 21 March 2016. ^ a b c "Legionella (Legionnaires' Disease and Pontiac Fever) Prevention". CDC. January 26, 2016. Archived from the original on 25 March 2016. Retrieved 21 March 2016. ^ a b c d "Legionella (Legionnaires' Disease and Pontiac Fever) Treatment and Complications". CDC. January 26, 2016. Archived from the original on 29 March 2016. Retrieved 21 March 2016. ^ a b c "Legionella (Legionnaires' Disease and Pontiac Fever) History and Disease Patterns". CDC. January 22, 2016. Archived from the original on 25 March 2016. Retrieved 21 March 2016. ^ a b "Legionella (Legionnaires' Disease and Pontiac Fever) Clinical Features". CDC. October 28, 2015. Archived from the original on 12 March 2016. Retrieved 21 March 2016. ^ Mandell, LA; Wunderink, RG; Anzueto, A; Bartlett, JG; Campbell, GD; Dean, NC; Dowell, SF; File TM, Jr; Musher, DM; Niederman, MS; Torres, A; Whitney, CG; Infectious Diseases Society of, America; American Thoracic, Society (1 March 2007). "Infectious Diseases Society of America/American Thoracic Society consensus guidelines on the management of community-acquired pneumonia in adults". Clinical Infectious Diseases. 44 Suppl 2: S27–72. doi:10.1086/511159. PMID 17278083. ^ "Legionella (Legionnaires' Disease and Pontiac Fever) Prevention". CDC. October 28, 2015. Archived from the original on 12 March 2016. Retrieved 21 March 2016. ^ a b "Legionella (Legionnaires' Disease and Pontiac Fever)". CDC. January 15, 2016. Archived from the original on 22 March 2016. Retrieved 21 March 2016. ^ a b c d e f g h Legionella and the prevention of legionellosis (PDF). Geneva: World Health Organization. 2007. ISBN 978-9241562973. Archived (PDF) from the original on 2011-05-03. ^ a b c d e f g h Cunha, Burke A; Burillo, Almudena; Bouza, Emilio (2015). "Legionnaires' disease". The Lancet. 387 (10016): 376–85. doi:10.1016/S0140-6736(15)60078-2. ISSN 0140-6736. PMID 26231463. ^ Ostergaard L, Huniche B, Andersen PL (November 1996). "Relative bradycardia in infectious diseases". J. Infect. 33 (3): 185–91. doi:10.1016/S0163-4453(96)92225-2. PMID 8945708. ^ Mahon, Connie (2014). Textbook of Diagnostic Microbiology. Elsevier Health Sciences. p. 416. ISBN 9780323292610. Archived from the original on 2017-09-08. ^ "Legionella (Legionnaires' Disease and Pontiac Fever)". CDC. January 22, 2016. Archived from the original on 1 February 2016. Retrieved 10 February 2016. ^ Correia, Ana M.; Ferreira, Joana S.; Borges, Vítor; Nunes, Alexandra; Gomes, Bernardo; Capucho, Rui; Gonçalves, Jorge; Antunes, Delfina M.; Almeida, Sónia; Mendes, Ana; Guerreiro, Marta; Sampaio, Daniel A.; Vieira, Luís; Machado, Jorge; Simões, Maria J.; Gonçalves, Paulo; Gomes, João P. (January 23, 2016). "Probable Person-to-Person Transmission of Legionnaires' Disease". New England Journal of Medicine. 374 (5): 497–498. doi:10.1056/NEJMc1505356. PMID 26840151. ^ a b c Fields, B. S.; Benson, R. F.; Besser, R. E. (2002). "Legionella and Legionnaires' Disease: 25 Years of Investigation". Clinical Microbiology Reviews. 15 (3): 506–526. doi:10.1128/CMR.15.3.506-526.2002. ISSN 0893-8512. PMC 118082. PMID 12097254. ^ "HSE – Legionnaires' disease – Hot and cold water systems – Things to consider". Archived from the original on 2016-03-29. ^ van Heijnsbergen, Eri; Schalk, Johanna A. C.; Euser, Sjoerd M.; Brandsema, Petra S.; den Boer, Jeroen W.; de Roda Husman, Ana Maria (2015). "Confirmed and Potential Sources of Legionella Reviewed". Environmental Science & Technology. 49 (8): 4797–4815. doi:10.1021/acs.est.5b00142. ISSN 0013-936X. PMID 25774976. ^ Winiecka-Krusnell J, Linder E (1999). "Free-living amoebae protecting Legionella in water: The tip of an iceberg?". Scandinavian Journal of Infectious Diseases. 31 (4): 383–385. doi:10.1080/00365549950163833. PMID 10528878. ^ Mahoney FJ, Hoge CW, Farley TA, Barbaree JM, Breiman RF, Benson RF, McFarland LM (1 April 1992). "Communitywide Outbreak of Legionnaires' Disease Associated with a Grocery Store Mist Machine". Journal of Infectious Diseases. 165 (4): 736–739. doi:10.1093/infdis/165.4.xxxx. PMID 1552203. ^ Winn WC Jr (1996). "Legionella". In Baron S; et al. (eds.). Baron's Medical Microbiology (4th ed.). Univ of Texas Medical Branch. ISBN 978-0-9631172-1-2. Via NCBI Bookshelf. ^ Cameron S, Roder D, Walker C, Feldheim J (1991). "Epidemiological characteristics of Legionella infection in South Australia: implications for disease control". Aust N Z J Med. 21 (1): 65–70. doi:10.1111/j.1445-5994.1991.tb03007.x. PMID 2036080. ^ Kohler R, Wheat LJ (September 1982). "Rapid diagnosis of pneumonia due to Legionella pneumophila serogroup 1". J. Infect. Dis. 146 (3): 444. doi:10.1093/infdis/146.3.444. PMID 7050258. ^ Makin, T (January 2008). "Legionella bacteria and solar pre-heating of water for domestic purposes" (PDF). UK Water Regulations Advisory Scheme Report: 4. Archived (PDF) from the original on 2016-03-05. ^ Almeida, D; Cristovam, E; Caldeira, D; Ferreira, JJ; Marques, T (1 November 2016). "Are there effective interventions to prevent hospital-acquired Legionnaires' disease or to reduce environmental reservoirs of Legionella in hospitals? A systematic review". American Journal of Infection Control. 44 (11): e183–e188. doi:10.1016/j.ajic.2016.06.018. PMID 27524259. ^ Winn WC (1988). "Legionnaires disease: historical perspective". Clinical Microbiology Reviews. 1 (1): 60–81. doi:10.1128/cmr.1.1.60. PMC 358030. PMID 3060246. ^ a b "Legionnaire disease". Medline Plus. US National Library of Medicine. Archived from the original on 5 July 2015. Retrieved 5 August 2015. ^ "Legionnaire disease". Encyclopædia Britannica. Archived from the original on 1 November 2013. Retrieved 30 October 2013. ^ McDade JE, Brenner DJ, Bozeman FM (1979). "Legionnaires' disease bacterium isolated in 1947". Ann. Intern. Med. 90 (4): 659–61. doi:10.7326/0003-4819-90-4-659. PMID 373548. ^ Fraser DW, Tsai TR, Orenstein W, Parkin WE, Beecham HJ, Sharrar RG, Harris J, Mallison GF, Martin SM, McDade JE, Shepard CC, Brachman PS (1977). "Legionnaires' disease: description of an epidemic of pneumonia". N. Engl. J. Med. 297 (22): 1189–97. doi:10.1056/NEJM197712012972201. PMID 335244. ^ "Legionellosis". Massachusetts Department of Public Health. Bureau of Communicable Disease Control. November 2011. Retrieved 2012-11-12. ^ Egan JR, Hall IM, Lemon DJ, Leach S (March 2011). "Modeling Legionnaires' disease outbreaks: estimating the timing of an aerosolized release using symptom-onset dates". Epidemiology. 22 (2): 188–98. doi:10.1097/ede.0b013e31820937c6. PMID 21242803. ^ Arreigoso, Vera Lúcia. "Surto de legionella é o terceiro maior de sempre no mundo: 302 infetados e sete mortos". Jornal Expresso. Retrieved 12 November 2014. ^ Reuters Editorial (29 July 2015). "Legionnaires' disease kills two, sickens 31 in New York City". Reuters. Archived from the original on 9 April 2016. Retrieved 31 March 2016. ^ "One Dead in New Bronx Outbreak of Legionnaires' Disease". The New York Times. 1 October 2015. Archived from the original on 27 April 2016. Retrieved 31 March 2016. ^ Associated Press (October 1, 2015). "Officials track down source of Legionnaires' in Calif. prison". CBS News. Archived from the original on November 11, 2017. ^ Sarah Kaplan (14 January 2016). "Flint, Mich., has 10 fatal cases of Legionnaires' disease; unclear if linked to water". Washington Post. Archived from the original on 28 March 2016. Retrieved 31 March 2016. ^ Renascença. "Legionella. Número de casos sobe para 53 - Renascença". rr.sapo.pt. Archived from the original on 1 May 2018. Retrieved 1 May 2018. ^ "Third case of Legionnaires reported at Quincy veterans home". wqad.com. 29 November 2017. Archived from the original on 28 December 2017. Retrieved 1 May 2018. ^ "Disneyland tower suggested as Legionnaires' disease source". Associated Press. 2018-12-05. Retrieved 2018-12-05.